Which kind of rat is this information for? Match these: Your rat is a friendly rat but sometimes when she's near a particular body part, she will nip just a little too hard. She does not draw blood. It's like she doesn't know her own (teeth) strength. You are not afraid of being bitten, but you wonder how to help her pay attention to the teeth pressure better, because the nips can kind of scare you, and can hurt, even if there's no blood drawn. You don't feel like you need to wear gloves, as she's not at risk for biting your fingers or hand if you touch her. If this is your rat, the method below may be helpful. This information is not appropriate for this type of rat: The rat that bites and breaks the skin, and/or who draws blood. A very unsocialized rat who is scared of you. A rat with a history of being aggressive. Important: JoinRats is not responsible for any injuries that may result from attempting this method. It can be tricky to correctly assess what is causing nipping behavior, or whether a rat is deeply fearful, or whether a rat might bite and draw blood. Before attempting an assessment and trying any intervention, seek help from knowledgeable sources to assess your rat correctly. Learn to read the body language of rats. "What can I do about my Flower problem...for the last few weeks she has been very nippy while she's on my shoulder, it has always been her choice to be on my shoulder. She is super friendly and the bites are totally at random. She has been in my house since she was 4 days old. She's gotten my neck a few times and my ear a few times. Once she actually latched onto my ear and I had to pull her off. She doesn't cause blood so I know it's not really a true bite, but it hurts. Tonight during playtime she bit my nose, and then 20 minutes later she flew up to my shoulder and got my ear lobe... Any ideas on how to stop this?" The most important thing I pull out of your description is that Flower isn't drawing blood. That can only happen because she intends not to. She deliberately makes sure she does not draw blood.. She doesn't want to draw blood. Every which way to say this = Yay! So in my mind she just doesn't understand how to be as careful as she needs to be. The average pet rat knows instinctually not to hurt their human, but some rats need help learning the limits. On the other hand, some rats do have an obsession with a body part - someone shared about the "evil lashy bugs", where eyelashes never were acceptable and the nips got dangerous to the human eyes. So if you practice the method I describe below, first you would assess if Flower can learn. Everything you wrote about your rat leaves me feeling you feel confident enough, and she's the right type of rat, that these ideas might help. But I could be wrong so please don't do anything you feel nervous about, or come back and ask for "what ifs" or "how-tos" or "something else needed here." Settle at a small play table or near her cage, or somewhere where you can relate to her. Work with her alone, no other rats involved. Have some yummy yogurt, maybe one-fourth of a cup. Each step below is meant to be repeated several times before moving on to the next step. You can even do one step several times for several days. It will depend on how the rat progresses. Many baby steps always make for better learning. The rat should be calm and feel like she's in her normal environment. None of these steps involve scaring the rat or inflicting any kind of pain. 1. Settle at the table. Block her from climbing onto you - we don't want to give her the opportunity to lunge and nip an ear. Smear a small amount of yogurt onto your forearm, and let her lick it off. You can tell her she's a good girl, but don't pet her to praise her. 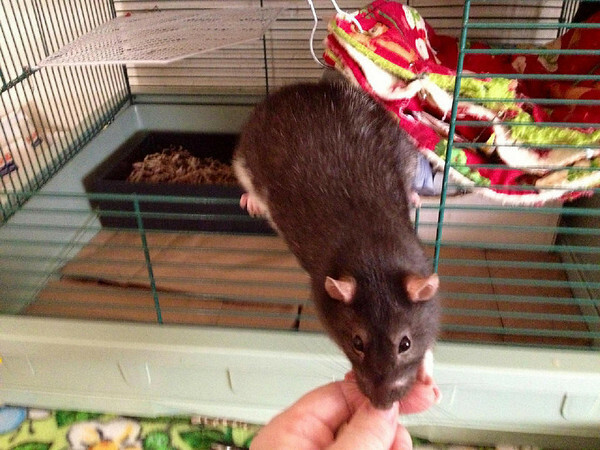 Lots of rats tolerate being petting or scritched, but they don't consider it a reward. Even one little stroke might not be experienced as pleasant. The yogurt is the reward for her good behavior. This rule holds true throughout all of these steps. 2. When she is done and she begins to look elsewhere, wait a few seconds and then add a new smear of yogurt so that you progress it down your arm towards your wrist. The goal over time is to have her build up her "I relate nicely to my human's skin"-type-muscles. The more she does of this, the better she will be prepared to un-do her bites. Remember you can do each step by itself in a day. No other steps needed. 7. Since Flower nips ears and neck, but sits very nicely on her human's neck: Bring her up to the shoulder, but block her access to neck or ear. Maybe wear a scarf or a wrap-around of fleece. Feed flower a smear of yogurt by hand - maybe the back of the hand would be easy mechanically. If she is good with your shoulder (doesn't think about nipping there), smear some yogurt there for her to practice. It is fine to smear 4 different dabs of yogurt on different areas of your shoulder, let her lick, and then finish the session at that. A. Protection first! : All through the shoulder activities, I would hover my entire hand over her entire torso, over her back, and be 100% prepared to direct her physically to move away. I might look in a mirror if I couldn't see her on my shoulder easily. The moment she begins to move towards an ear or other body part, I would gently divert her away. Not necessarily off my shoulder, but facing forward. My redirection is always calm, and I would not try to scare her or yell as if to say 'bad girl'. Just the redirection is enough. Then in the moment she is facing forward, she gets some licks of yogurt for being in that good spot doing that good behavior. B. Anticipate! Many times you can tell that the rat is thinking about doing "more". My anticipation and alertness are 100% revved up here. Yes, I would let her move to check me out, with my hand over the back of her torso. But before she reaches any nippable spot, I would use the "Eeep!" method in conjunction which blocking/diverting her with my hands. The Eeep method: Eeep as close as you can to the real objection-type squeak that a rat makes. Your Eeep should be a low- or medium-level, volume, just like you've heard rats do with each other. The Eeep you make is not supposed to be a yelled eep that would scare the rat, but to convey a point: "I don't like that". Ideally you would see some recognition on the rat's face: "Oh, you don't like that? Okay..." Your particular rat may or may not be able to respect or relate to your objection Eeeps; however, if you do them in conjunction with moving her away at the same time, she may make the connection over time. C. Reward the good behaviors to strengthen the good behaviors. Far more important than blocking her from possibly nipping, is rewarding her for any and all good behaviors she does. This positive reinforcement is the ultimate learning method for any animal: When she does a good behavior, immediately reward (reinforce, with a treat) her for this. Do a lot of quick rewards, so that you intensely reinforce her good behavior moment to moment. For example: if you place her on your shoulder one time and remarkably she sits there and faces forward for just a second (say she hasn't done that before), Treat, Treat, Treat, one after the other, because you are rewarding each moment of good behavior of sitting quietly facing forward. Then she turns and faces elsewhere, away from your neck: Treat Treat Treat. Good girl! Help the friendly rat slow down and be careful when they use their teeth for friendly reasons. Pemy was extremely aggressive when she came to me. Several months later and with careful work on her aggression, and she switched to friendly. Now I encourage her to relate with her teeth to my skin, to get some good practice. Here I held on to the treat for a second or two, giving her time to manipulate her teeth around my fingertips, to pull the food away. I want to further her investment in me as "her good human".